Until this year, I had never watched the Kentucky Derby. I tried to watch it a few times, but if you don't get your timing exactly right, you'll miss it. This year, I was invited to a Kentucky Derby party thrown my some of my friends who are from the South and I finally managed to watch the race. The party host requested that we dress in our most Southern attire, which for ladies included sun dresses and hats. You can't buy Derby hats in Denver, so I decided to create my own. I found a long gold ribbon in my craft box and used it to cover the beachy rope that surrounded the hat. I didn't want to destroy the original hat or glue anything directly to the hat, so I wrapped the ribbon around the canvas string and let the excess dangle off the hat. I purchased the big white bow from Target, but you could make one of these, too. I secured it to the gold ribbon by tying it on with a small piece of string. My original plan was to only have the white bow, but after looking at some Derby hats online, I decided my hat needed a little more flare. I looked up some ideas for making paper flowers and found this awesome tutorial for rolled paper flowers from Jones Design Company. These flowers are really easy to make and look beautiful. Everyone commented on my paper flowers and I must have described how to make them a dozen times. Check out the full tutorial from Jones Design company. I made 5 paper flowers and after gluing them together with a hot glue gun, I stuck colored paper clips through them so I could secure them to the hat. I folded up a little green ribbon and glued it into one of the flowers (seen above in the purple flower). Make your Mint Julep and cheer for your horse! I loved the way my Derby hat turned out. Sadly, I didn't win the hat contest. Someone else "put a bird on it". My horse didn't win either, but at least it came in second! The Derby was fun to watch, but it seems like a lot of buildup for such a short race. Maybe I'm just a Yankee at heart. Easter seems to sneak up on me every year. I'm never prepared with Easter foods or crafts. And I end up sharing what I did for easter a month afterwards when no one really cares anymore. This year I'm finally on top of things. Instead of telling you about my Easter tradition in May, I'm ready with a tutorial in March so you can enjoy this activity before Easter. My Mom is 50% Ukrainian and since I was a little girl, we've had a tradition of creating and decorating Ukrainian Eggs. Many of the supplies we have belonged to my Mom's grandmother and aunt. They passed along the tradition to my Mom who passed it on to me. Back in the Ukraine, egg decorating was a women's activity. My brother used to try it with us when we were young, but he never had much patience for it and didn't enjoy it. Working with raw eggs is tricky making this type of art precise. It also requires quite a bit of patience. It can take hours to complete one egg. And sometimes when you've completed your masterpiece egg, you drop it and it breaks, ruining all your work. I can't tell you how many times that has happened to me over the years. It can be frustrating, but it's also really rewarding. My favorite part of the process is melting the wax and seeing the final design. The infographic below will show you the basic steps for creating an egg. You can find more designs and purchase supplies from the Ukrainian Gift Shop. And I highly recommend making some Paska (Ukrainian Bread) to eat while you're decorating! I loved to create black magic as a child. Before you start a witch hunt, I don't mean the malevolent type. My "black magic" involves crayons and paper and toothpicks. Black magic may not be the most appropriate name, but I assure you that this type of black magic is very kid friendly. I don't remember the last time I used crayons for any craft project, but when I pulled out my craft / card-making supplies yesterday, I discovered a box of crayons that had never been opened. All my childhood memories of creating black magic masterpieces came rushing back to me and I decided to create a black magic card. Draw a shape and color it in. 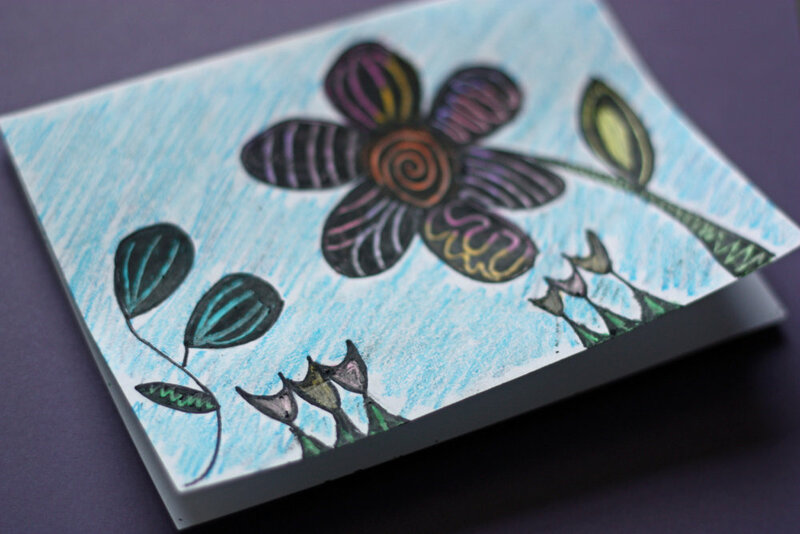 You can draw a design with pictures (like I did with the flowers for my card). Or, you can create a rectangle or square to use as your canvas (like I did below). Black magic works best if you mix in lots of colors in random designs. Strips of color also work well. This is the fun part...find a sharp object (toothpicks or skewers work well) and draw/scratch your design with the pointed object. Have you ever tried black magic? Do you have a more appropriate name for it? Is Google going to surprise people by bringing them to a craft blog when they're searching for"black magic"? I spent the better part of my days in May and June behind my computer, writing cover letters, sending out my resume, searching for jobs. In July, it felt like I spent hundreds of hours on the phone answering questions in interviews (my cell phone bill recently confirmed that I did in fact spend this much time on the phone). My efforts paid off and I now have a job! While I have lots of logistical details to take care of before I move to Boston, August the month to enjoy what's left in the summer. I've been taking long bike rides (and have the sunburn to prove it), reading outside, and going on hikes. Last week, I tackled a furniture refurbishing project. And believe me, it was a project... When I left Seattle a year ago (wow, has it really been a year? ), I sold my IKEA dresser that had served me well for 4 years. It wasn't the sturdiest dresser and had already survived a move from Brooklyn to Seattle, but it didn't seem worth transporting from Seattle to Denver to.... All that said, I needed a new dresser to bring with me to Boston, so I began scouring craigslist for something I could refinish. 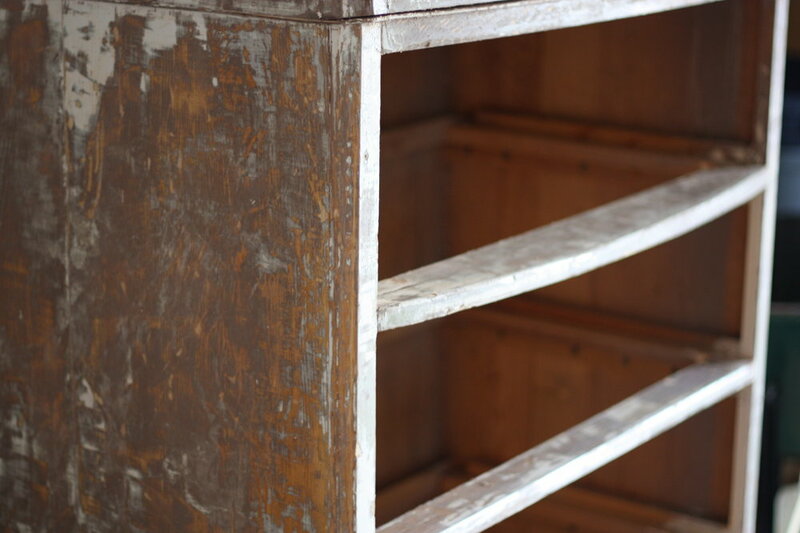 The dresser is very heavy and sturdy and made of real wood (pine, I think). But as you can see, it needed some serious work. I bought it from a woman in her mid-60s who told me that her recently deceased Mother had owned it her whole life. So it's pretty old, but I thought it had good potential. I needed to get rid of that crusty, white paint on it. After washing the piece off (it was dusty and had cobwebs) and removing the knobs from the drawers, I covered it in paint stripper. I discovered a few things while stripping. 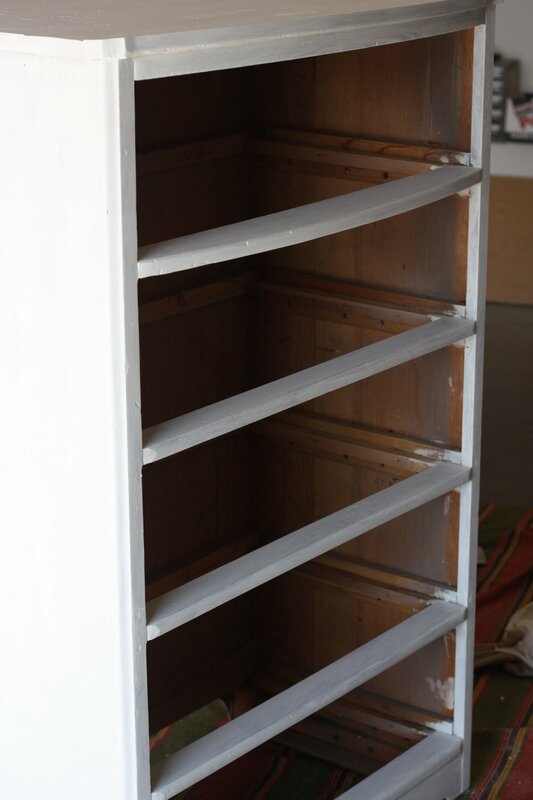 1) There were at least 2 layers of paint over a stain that needed to be removed to get to the original wood. The paint came off pretty well, but the stain was very hard to remove. It took a few coats of the stripper, plus some paint thinner, plus lots and lots of sanding. 2) There was a layer of ply board on top of the dresser, nailed to the wood. It was fairly rotted out by the layers of paint and stain and chipped off in some areas. I decided to remove it completely and see what the wood underneath was like. I used a chisel and hammer to remove it. The wood underneath was much better than the ply board, but did have some uneven parts. After most of the paint and stain was removed, I sanded the piece. I don't have a sander, so this was all done by hand. I also used wood putty to fill in some gaps in the wood. There was one area that had a gap between the wood. I considered using some small nails to close it, but then decided Gorilla Glue would be easier. After filling with wood putty and gluing where needed, I did another round of sanding. Finally, I washed it all off to get rid of dust and other particles. Some pieces of furniture don't need primer, but since I wasn't able to remove all of the brown stain from the original wood, I decided it was best to prime first. In fact, I put on 2 layers of primer to make the dresser nice and white. After the primer dried overnight, I started applying the paint. I put on a very thin first layer and after it dried, applied a second...and third...and fourth coat! Finally it looked even and the primer was covered. To finish off the piece, I used wood stain. I read online that you can stain painted furniture with a chestnut colored stain and it provides a nice finished look. I was a little nervous about applying a dark brown stain to the paint, but really liked the results. It doesn't soak in completely to the paint like it would to an unfinished wood surface. After you let it soak for 10-15 minutes, you merely wipe off the excess. It made the color a deeper and darker teal and gave it a nice finished look. 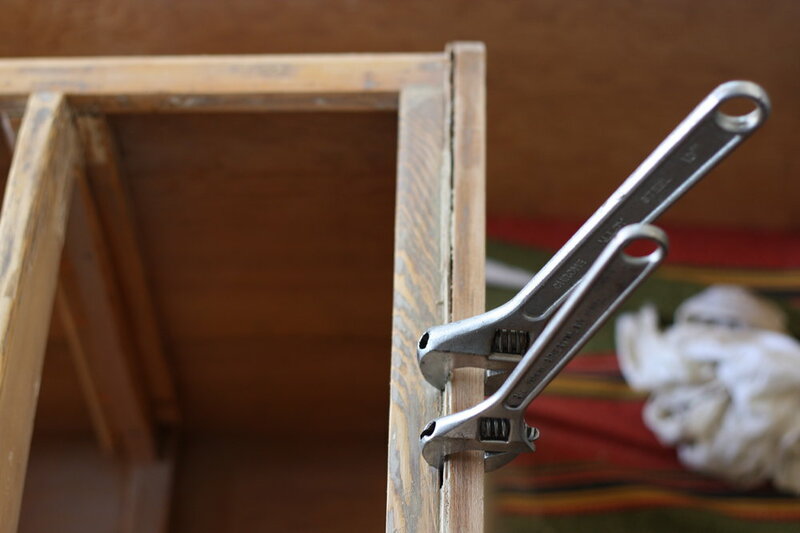 The insides of the drawers needed some attention, too. I primed inside to cover up the brown stain. 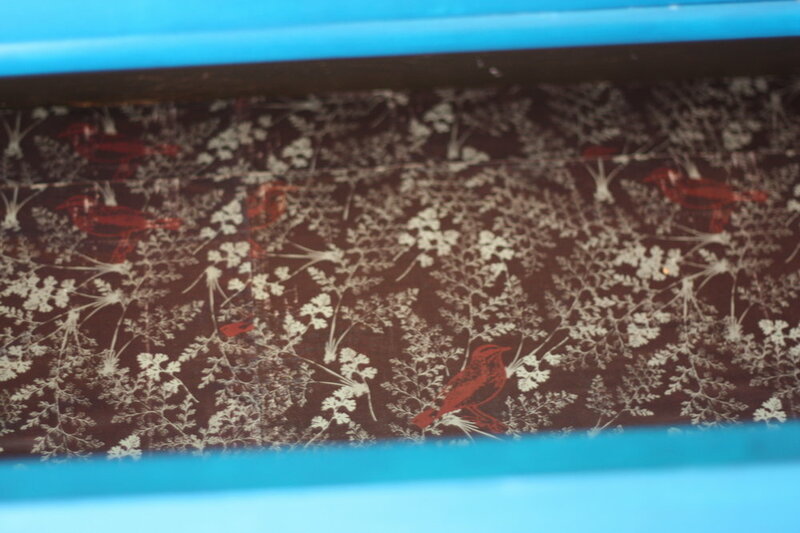 Then, I painted the walls of the drawers a dark brown that was left over from another project. I lined the bottoms of the drawers with paper. The paper is normal, scrapbook paper from Hobby Lobby. I cut it to size and then secured it on the bottom with double-sided tape. Then, I used Mod Podge and a foam brush to cover the paper. It seals the paper so it won't rip or get water damage. The last thing I wanted to do was find a way for the drawers to slide in and out easier. (There are no metal parts, just wood on wood.) Sanding helped, but it was still a little rough. The helpful salesperson at Home Depot suggested that instead of buying one of their products, I should try melting a normal, household candle on the surfaces that rub. I tried that today and it worked great! They slide in and out with ease. I imagine that the wax will need to be replaced from time to time, but it was a simple and easy solution. I'm excited to put the new dresser in my new apartment in Boston in a few weeks! Hopefully it gives it just the pop of color that my neutral color scheme needs.